A 2012 Massey Hall tribute to Kate McGarrigle, who had died two years previously of cancer, was the impetus behind this lively, evocative memoir by the musician’s surviving sisters, Jane and Anna—the latter the other half of the Canadian folk-duo who rose to fame starting in the mid-seventies (the authors are also aunts to Kate’s famous children, Rufus and Martha Wainwright). 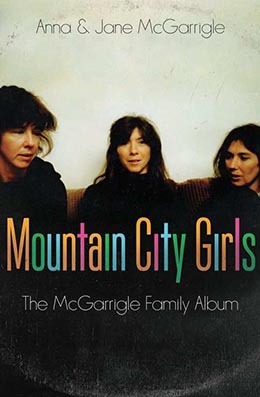 Mountain City Girls details the McGarrigles’ colourful Irish-French lineage as well as their slightly shambolic upbringing in Quebec’s Laurentians region and teenagehood in Montreal during the fifties and sixties. In their seemingly effortless bridging of the two solitudes in pre-Bill 101 Quebec, the bilingual McGarrigles now seem ahead of their time (their mother, Gaby Latrémouille, spoke French, but her maiden tongue was English), though Jane notes this was more the result of pragmatism than cultural enlightenment: they went to the local French Catholic convent school because it was closer than the English one. The McGarrigle parents were conscientious but “supremely unconventional.” An especially vivid portrait emerges of their father, Frank, a war veteran who worked various sales-type jobs after a stint with Montreal’s Ferry Command before his sudden death, in 1965, of emphesema. Frank’s influence was powerful and positive: gifted musically, despite having had no training, he encouraged self-expression and independent thinking in his three daughters. As they take turns at the narrative helm, Jane and Anna capture, beautifully and nostalgically, the tangible sights and social realities of an Anglo-Quebec culture that has largely vanished. The book comes to a sudden end in the late seventies, when Kate and Anna are in their career ascendancy. One senses certain unspoken sensitivities at play in the somewhat random endpoint.